The Carcano rifle is an astounding piece of art that served both World Wars. The rifle consists of a classy design that attracts the hearts and minds of warriors. The rifle was created by Lt. Colonel Salvatore Carcano. A Colonel Paravicino controlled Italy’s procurement of arms between 1890 and 1891 and is responsible for the design changes for the “Modelo 1891”. The rifle was vigorously used by the Italian Army as the “Carcano Modello 1891”. When it comes to service, this rifle did an amazing job. It outpaced many other rifles in the industry with class. As the new 6.5x52 mm Mannlicher-Carcano rifle cartridge was developed, Italians designed a rifle to support it. This can be attributed to the modification of the basic Mannlicher structure. 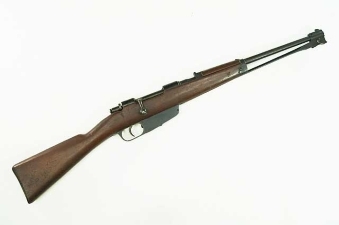 The internals of the basic German Mannlicher were modified to suit the Carcano rifle. For example, the handle was turned down and set aside the prime receiver. Consequently, a special safety mechanism was introduced into Carcano rifle. A prime feature of the mannlicher would be its patented in-built magazine facility. The rifle uses the clip loaded magazine facility to load and reload quickly. Of course, the foremost action is achieved by placing prefabricated chargers along with the base clip. Discourse on the Carcano rifle would not be complete without considering the stock. Rifles received by the Italian army had beautiful full-length wooden stocks. These stocks ensured a sturdy grip and a pleasing aesthetic. An eye catching element in Carcano rifle would be the short piece of fresh wood over the base of the barrel. This piece of wood serves as the hand guard. Just like many other service rifles (at that time), Carcano has the ability to be mount field bayonets. With time, Modello 1891 was shortened to a handier size. The full length rifle was made shorter for easier use. However, most soldiers admired the original Carcano rifle and its accuracy. The new shortened versions of Carcano Modello 1891 rifle were released in 1924. The change was done to support both carbine and long guns concurrently. In simpler terms, the shortened gun made life easier on the field. Even today, fighters love the original Carcano rifle. Many believe that the rifle played a crucial role in both World War 1 and World War 2. Any gun enthusiast has to tip their hat to this piece of art by Colonel Paravicino. While a very popular rifle with a long service history, two anecdotes often taint the Carcano’s reputation. The first is a malfunction that lead to the demise of the allied soldier that was firing it. Second is that people were reporting the rifle as inaccurate or that the cartridge was not powerful enough, earning it the nickname the “humanitarian rifle”. The first is not substantiated and the second is easy to dismiss by actually firing the gun. Aside from these complaints, the rifle has a fantastic and lengthly service record and is as accurate as any other gun in the same category.